Almost twenty years ago, a friend of mine who had just gone through a painful divorce visited me in Atlanta. We spent the Sabbath together, during which he shared many of his intimate feelings with me. I did not speak much, but allowed him to express long-repressed emotions. After the Sabbath was over, I decided to introduce him to a widow that I knew. I thought to myself that we can never know what G-d has in store for us, so perhaps he came to Atlanta so I could introduce him to this sweet lady and that would be the beginning of his new life. Nothing ever came of the date that I arranged; but a few weeks ago, I received a call from my friend whom I had not spoken to for many years. His son was getting married in Israel and he wanted to share with me this happy moment in his life. I visited him and his new wife, to whom he had been married for eight years and he told me how much he appreciated my giving him good advice so many years ago. He felt that I encouraged him to be strong in the face of adversity and to put his emotional life back together again. I had no recollection of what I said so long ago, but he remembered the kindness vividly. For him, it was a kindness that spanned generations and for which he was eternally grateful. Acknowledging the good that people do for you is one of the cardinal principles of Judaism. So ingrained is it in the Jewish psyche that it evens extends to recognizing the good that inanimate objects do for you. Our oral tradition tells us that Moses did not strike the Nile during the Ten Plagues to turn it into a river of blood because he owed a debt of gratitude to the river that saved him as a child. All the more so should we be grateful to human beings who do kindnesses for us. 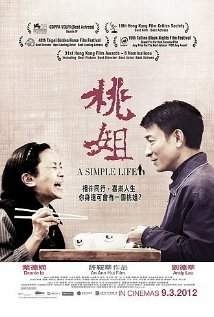 This is the implicit lesson of A Simple Life, a story of Ah Tao, a maid living in Hong Kong that has been in the employ of the same family for over four generations. After suffering a stroke, she announces to the family that she no longer wants to work; rather she wants to move into an old age home. The film details the challenges she faces as her health declines over time, and the efforts of the family to care for her in recognition of the service she has given the family for almost 60 years. The key family member that is charged with taking care of Ah Tao is Roger, a 30-something bachelor, who works in the movie industry. In the midst of a stressful business and conversations about money, he does not forget Ah Tao, but rather remains solicitous and concerned about her welfare. Being involved with her adjustment at the nursing home, he becomes more aware of Ah Tao’s contribution to the happiness of his family over the years. For her part, Ah Tao wants to be as independent as possible and so she makes no demands upon the family. She even refuses financial help from them. In many ways, Ah Tao served as Roger’s surrogate mother, sharing special moments with him when he was a child. Roger remembers this and treats her with the respect due to a mother. He escorts her to a movie premiere where he introduces her as his aunt. He arranges for visits to physicians. He even tries to find her an apartment in which to reside as her end draws near. He wants her to feel that she in a home, not an institution. A Simple Life moves at a slow pace. Its rhythm is the rhythm of life, and the film requires patience. Its portrayal of the day to day interactions of people who are getting older and the caregivers who observe them getting older gives the viewer a visceral understanding of how important it is to treasure the moments and the memories of people who have been kind to us. We should not forget them. A Simple Life reminds to be grateful to those who have assisted us on our life’s journey.